You’ve probably heard of the Blue Zones. These unique pockets of the world boast high percentages of centenarians. In general, people in these areas live long, healthy lives. Researchers are constantly exploring these areas to uncover their secrets. Some of the healthy habits are standard. People in these areas tend to eat a lot of vegetables, lead active lives, and have strong social connections. But in the Blue Zone of Okinawa, Japan, residents do have a secret ingredient. They both consume it and use it topically. It helps them not just live longer but look good doing it. The Okinawans love this remarkable and highly active natural plant solution. It’s rich in natural polysaccharides, and it helps protect the skin. It even supports immune function both topically and internally. And it helps the skin retain moisture more effectively. This secret ingredient is simply red algae from the sea. The red algae that Okinawans use is just one of several types of beneficial marine algae. Researchers have been investigating algal compounds to see what they have to offer the skin. And because these algae are chock-full of bioactive compounds, they can be incredibly nourishing and protective. In fact, seaweed is one of the healthiest foods on the planet. It is packed with vitamins, minerals, trace minerals (a different complex compared to land vegetables), and antioxidants. Marine algae come in four groups, divided by color: red, brown, blue-green, and green. Most of the highly nutritious sea vegetables we eat are made from one of these algae. You may know them by different names. For instance, Nori and Dulse are made from red algae. Then there’s Kombu or Kelp and Arame, which come from brown algae. Chlorella and Sea Lettuce are made from green algae and Spirulina is made from blue green algae. Similarly, other sea vegetables that are edible include Wakame, which is a green sea vegetable, and Hijiki, which is a brown sea vegetable. Each of them offers various benefits, and people throughout the world consider many kinds of algae a delicacy. Like with fruits and vegetables, consuming the full spectrum of colors provides a variety of benefits. Algae are rich in fiber, omega-3 fatty acids, amino acids, and vitamins A, B, C, and E.
If you didn’t grow up considering algae a delicacy, it may not appeal to you. That’s ok. You can experience many of the benefits these nutrients have to offer by applying algae topically. I’m sure you’ll recognize several of these nutrients as standard skincare superstars. Many studies have focused on brown algae because it’s so rich in antioxidants. 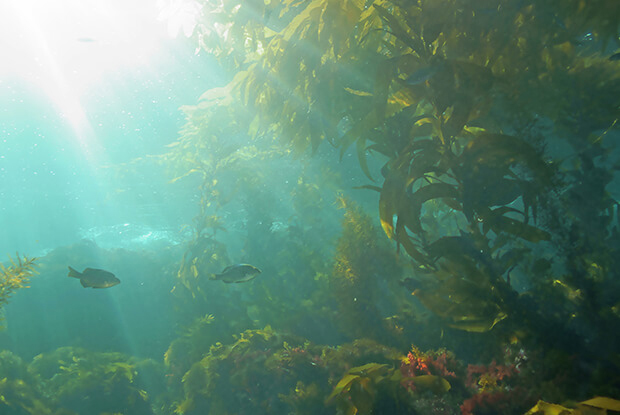 Brown algae has been shown to slow down cellular aging. In particular, it fights matrix metalloproteinase (MMPs) from forming. MMPs break down collagen. This leads to wrinkles and other signs of aging. Sun exposure can ramp up the activity of MMPs. But studies have found that extracts from marine algae can keep this increase in check. In particular, a study of the alga Corallina pilulifera found that it could both keep oxidative stress from occurring in response to UV rays and prevent MMPs from harming dermal cells. MMPs break down the extracellular matrix. And they contribute to a number of inflammatory conditions. So algae’s ability to inhibit MMPs helps explain its ability to soothe inflamed skin. In particular, algae can help with atopic dermatitis (AD). AD is an inflammatory skin disorder. It’s common in people who suffer from allergies. While it’s most common in children, it can strike at any age. Its prevalence in the US is growing, and it affects approximately 17% of the population. AD is essentially a skin barrier problem. When the skin barrier (the first line of defense of the skin) doesn’t work right, the skin has trouble holding on to moisture. This makes the skin dry and itchy. People then scratch their itchy skin, making the problem worse. As the skin barrier breaks down further, antigens and bacteria can enter the body. The immune system then kicks in to deal with the invaders. This creates more inflammation, wreaking havoc. AD is notoriously hard to treat. The first response of dermatologists is often prescription drugs – many of which include cortisone. These solutions usually work nicely initially, but are not permanent. Algae may be able to help. Studies in rat cells have found that phlorotannins from marine brown algae can greatly reduce the release of histamines. This means that algae extracts may be helpful in reducing the inflammation associated with histamine release and ultimately helping out AD. In fact, some of the phlorotannins extracted from algae were up to seven times stronger than one of the key components of anti-allergic drugs! This is great news for people looking for a natural solution to allergies and inflammation. Another study in mice with AD looked at the effects of extracts from the alga Ecklonia cava. These extracts are high in polyphenols. And the mice certainly benefitted from them! After just 21 days of treatment, the mice showed astounding improvements. They fared much better than mice who received a commercial AD drug. Yet another study found that the alga Eisenia arborea contains a powerful phlorotannin called phlorofucofuroeckol-B. This phlorotannin was even better at inhibiting allergies than epigallocatechin gallate (EGCG). My long-time readers will likely recognize EGCG as one of the best parts of my beloved green tea. You all know how much I love green tea, so if this works even better, that’s really saying something! AD isn’t the only disease that algae can help with. Several components of red algae have antibacterial effects. Others have antifungal properties. Studies have even found that extracts from brown algae can fight Staphylococcus aureus and food-borne pathogens. Fighting bacteria this way can help you avoid frustrating breakouts on your skin. Some algae even have anti-cancer effects. In particular, a mouse model found that polyphenols in brown algae could inhibit skin cancer from UVB rays. Of course, cancer is the worst possible outcome of UV exposure. But these rays also age our skin prematurely. By protecting our collagen and reducing inflammation, algae can go a long way toward reducing photoaging. Red algae has been used for thousands of years in the Orient as a source of food and for improving medical conditions. The main benefits of red algae is its ability to promote healthy circulation in your body, regulate your blood sugar levels, and lower bad cholesterol levels since it’s high in dietary fiber. It is also a rich source of dietary calcium and magnesium, so it can contribute to bone health as well. One amazing ability of red algae is its natural inclination to process sunlight. This trait makes red algae particularly effective at protecting your skin against UV light. But this incredible food does a lot more for your skin. We used red algae extract in the Système 41 Day Crème and Night Treatment because of its UV protection and because it contains high quantities of sulfated polysaccharides (carrageenan), peptides, carotenoids, and fatty acids. Together these components give red algae its antioxidant abilities. They allow red algae extract to neutralize free-radicals that are present in the environment, including those coming from pollutants. If left unregulated, these aggressive free radicals can cause damage to the skin. You may notice an ingredient in skin-care products called rhodophyta seaweed. This is just another name for red algae. Red algae extract also serves as a thickening agent in skincare products. It provides a more desirable and spreadable texture to lotions and creams. Red algae is easy to incorporate into your lifestyle by enjoying vegan sushi rolls or some miso soup. Sushi is made with Nori sheets, so this is one of the easiest ways to get the benefits of red algae. Nori, in Japanese, means “edible seaweed” and is almost 50% protein, the highest of any seaweed. Nori also has high levels of B12, a nutrient often deficient in vegetarian and vegan diets. Because of its salty taste, you can put red algae in any dish instead of salt. There are also healthy snacks and crackers made from Nori. And if you want the benefits of red algae without eating it (some people just don’t like it), there are red algae supplements that are available. Algae has been a Blue Zone secret for centuries. But now you can take advantage of it even if you don’t live anywhere near Okinawa or the other Blue Zones. If you combine it with other longevity strategies, you may be able to surprise people with your age for decades to come.